For hardware revision LH43V14 only, this units came with a blue carNAVi SD card. Please check hardware revision in settings/sysinfo first. 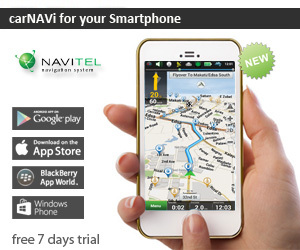 This installer performs an update of the NAVITEL navigation software. 1. Download the installer and save the file on your local harddisk, for example on your Desktop. 2. Connect your carNAVi device via USB cable. 5. After the updater has completed, disconnect your carNAVi device from USB and start the navigation software. If needed, the navigation program will perform an indexing of the maps, please do not interrupt this. Note: This update will install optimal default settings, your waypoints and history data will remain. Where is the best place for the windshield holder? How can I get the carNAVi App for smartphones? How to solve "wrong version" error during update? carNAVi Corporation, established in 2007, is a leading developer and manufacturer of GPS devices, navigation software and digital maps. Our product portfolio includes carNAVi branded mobile navigation devices and OEM hardware and software solutions for the automotive industry. carNAVi GPS Navigation in the Philippines and SE Asia. Buy affordable high quality GPS maps and GPS devices with reliable service and support. ©2019 carNAVi Corporation, All Rights Reserved. carNAVi, carNAVi Store and the carNAVi logo are trademarks or registered trademarks in the United States and other countries. Microsoft Windows and the Windows Logo are registered trademarks or Microsoft Corp. in the United States, other countries or both. MAC OS-X and the Apple logo are registered trademarks of Apple Inc. in the United States, other countries or both. Other company product or service names may be trademarks or service marks of others.